Our GHCHS Algilata OpenROV project is not located near the ocean. The OpenROV community has found that salt water operation can be flakey compared to fresh water due to low resistance between the salt water and external wires that connect the battery tubes and the motors. This post deals with making simulated sea water for testing the OpenROV in the lab. Sea water conducts electricity due to the dissolved salts that produce ions for transporting charge between conductors submerged into the water. Typical sea water has 35 parts per thousand by weight of salt in water. Since water at standard conditions weighs 1000 grams/liter then we can say that sea water has 35g of salt per liter. I wanted to use just a cup measure to make a batch of sea water. So I weighed one cup some Himalayan salt and found that it weighed 8 oz. So we can estimate the weight of salt using this ratio…about 1 avoirdupois oz weight per 1 fluid oz . Of course this will vary with the granularity of the salt due to variations in packing density but it should be good enough for conductivity testing. 1 avoirdupois oz per 27.2 fluid oz. Scientist often use conductivity to estimate salinity. 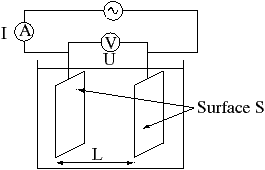 Standard units of conductivity are Siemans/meter (S/m). The electrical conductivity of 35 ppt salt water at a temperature of 15 °C is 42.9 mS/cm (ref). Thus 35 ppt equates to 42.9 mS/cm. Conductivity measurements assume that there are two parallel electrical plates of area A in water at a distance L apart. If a voltage (V) is put across the plates and the current flow (I) measured then the conductivity k = I/V*L/A = L/(R*A) where R is the resistance V/I. Under ideal conditions the conductivity between the ROV wires and the water should be very low (high resistivity) but if a small area of copper is exposed then conduction can occur. eg some OpenROV forum members are finding resistance on the order of kiloohms rather than megohms. Practically, if you put two probes from an ohm meter into water, the measured resistance will depend upon the area of the probe submerged and the distance between them. You can use this as a reference to test your simulated sea water at home. I made a simple crude conductivity instrument out of a two prong to three prong electrical plug adapter. The plug prongs are separated by 1 cm and the exposed area between the prongs is almost exactly 1 sq sm. I covered the non-facing sides with tape or you could use paint or nail polish to insulate the surfaces from water. See photo. 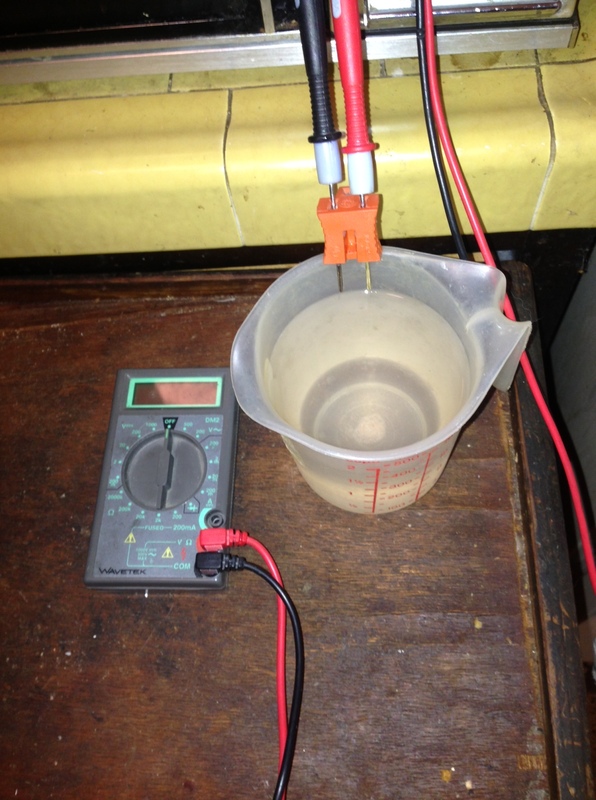 In the field, dip the plug tester prongs into the water and measure the resistance between them. Note the temperature since conductivity varies a lot with temperature. Theoretical plug conductivity prediction for sea water. When creating your simulated sea water at home you would like to have similar conditions. You would add salt to your water tank/tub until the resistance level matched. I did a quick conductivity test by dissolving 1 tablespoon of Himalayan sea salt in 1 3/4 cups of water. The measured resistance using my plug conductivity tester was around 3 kohms with a VOM meter and using the voltage / current method the resistance was 230 ohms. So it is reading much higher than the theory. The test was done at 70F (21C). Temperature changes the conductivity about 2% per degree. The measurement was 6 deg C higher so at most we would expect a 12% increase over the 15 C reference. The absolute measurements can vary too much with conductivity so I would recommend just using the 35g/kg salt/water mixing method or just doing relative conductivity measurements..i.e. matching field conductivity to home conductivity under similar conditions.